Thirty years ago, The Municipal Art Society of New York (MAS) launched the Adopt-A-Monument program in collaboration with the NYC Public Design Commission and the NYC Parks Department, to secure private funding for the rescue of public art in danger of deterioration. To date, MAS’s Adopt programs have raised nearly $4 million dollars to conserve fifty-one works of art in all five boroughs. In honor of the 30th anniversary of the program, we are highlighting one restoration per month in 2017. Alice Aycock’s acclaimed work East River Roundabout on the East River Esplanade in Manhattan. Photo: Malcom Pinckney, New York City Parks. Alice Aycock’s sculptural installation, Roundabout, was conceived in 1994 as a response to the clamorous visual environment of the Queensboro Bridge and the FDR Drive. Built on the steel frame that once housed the decades-old Sanitation Department Transfer Station at the East River at 60th Street, the spectacular piece is a combination of industrial form and sculptural exuberance while simulating the weightlessness of Fred Astaire’s dancing, which partially inspired it. Roundabout, made of unpainted aluminum, incorporates images of wheels, spirals, whirly-gigs, ladders, and fans, all of which are references to energy – of the city, of ideas colliding, and of the drama of this dynamic setting. Alice’s works draw from the ramifications of technology, from the simplest tool to the computer, executed in the most inventive and exciting way. Photo: Malcom Pinckney, New York City Parks. The idea for an open-air pavilion park was first envisioned in the late 1980s after the Municipal Art Society and the Parks Council opposed a plan that would place a hotel on this former garbage facility at this waterfront site. At a presentation by the developer and the Economic Development Corporation, the two advocacy groups insisted on a better solution. With funding from the Greenacre Foundation, revered landscape architect Nicholas Quennell and advocates saw this as an opportunity to attract people to the neglected East River Esplanade. Eventually, as recreational use of the waterfront became a pressing city planning goal, public agencies came on board with the idea. At that point, NewYork-Presbyterian Hospital, Rockefeller University, and The Hospital for Special Surgery, as part of their obligation for use of the air rights over the FDR, funded the project with $2.1 million. 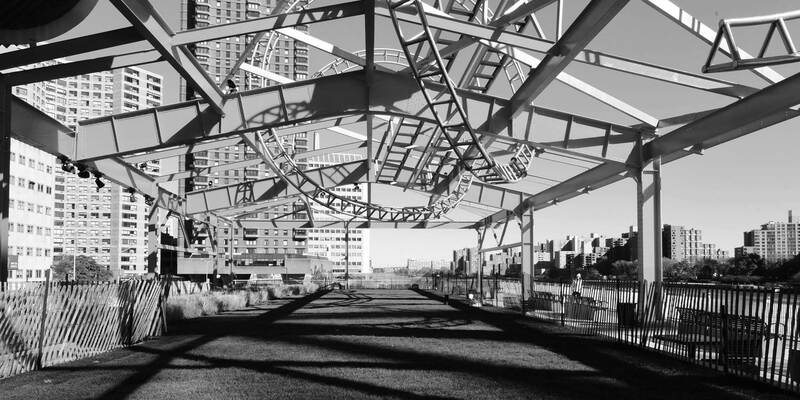 The ambitious Pavilion reconstruction involved removing walls and roof of the old Transfer Station leaving only steel beams and readapting the space for use as a new park and public resource along the East River. This launched the first part of a conceptual plan for the East River Waterfront between 59th and 62nd Streets. Carole Rifkind, President of the East River Conservancy, was the leading force behind the vision of an art installation within the park. Collaborating with her was the architectural landscape firm, Quennell Rothschild Associates. The original project engineer was Thorton-Tomasetti; the principal design work was by HOK/TCA. Private Funds for the maintenance and conservation of the art work were solicited by the Municipal Art Society’s Adopt-A-Monument program which continues to be the custodian of this extraordinary public sculpture. The Roundabout was fabricated using all aluminum materials. The design included three main features: tubular spirals, stairs, and “wave”. In July and August 2014, the sculpture was conserved by the American Stripping Co, ASCO, under the MAS Adopt Program. All surfaces were power washed and sprayed using a salt removing solution, then rinsed. Access to the elevated sculpture was performed using 60-foot reach-powered man lifts. Power hand tool equipment, such as sanding belts, were used to remove corrosion. Electric drum polishers were employed to provide the final bright finish. The “wave” element required additional treatment after power washing due to heavier corrosion on the underside. A strategy was devised to apply a protective paint coating using brushes and rollers. The steel skeleton was painted a dazzling orange-red color chosen by the artist. Alice Aycock is one of the most acclaimed sculptors and installation artists in America. Her solo exhibition at the prestigious Marlborough Gallery on West 57th Street highlighted her recent work, Turbulence Series, both large and small scale aluminum pieces; and works on paper. Several fantastic large pieces remain on the roof top of the gallery for now. 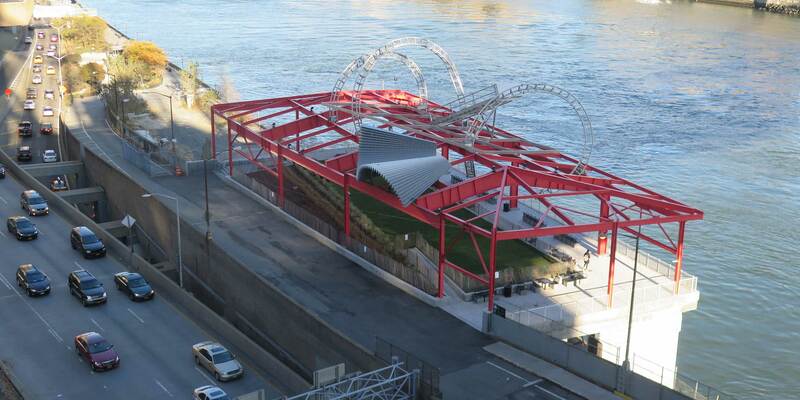 On November 17, 2017, a ribbon-cutting ceremony at the East River Pavilion opened the newly renovated Andrew Haswell Green Park under the Roundabout, featuring a large lawn with shrubbery surrounded by seating, and chess and checker tables, for people to enjoy river views, passing boats, sunbathing, and best of all, Alice’s awe-inspiring monumental sculpture. 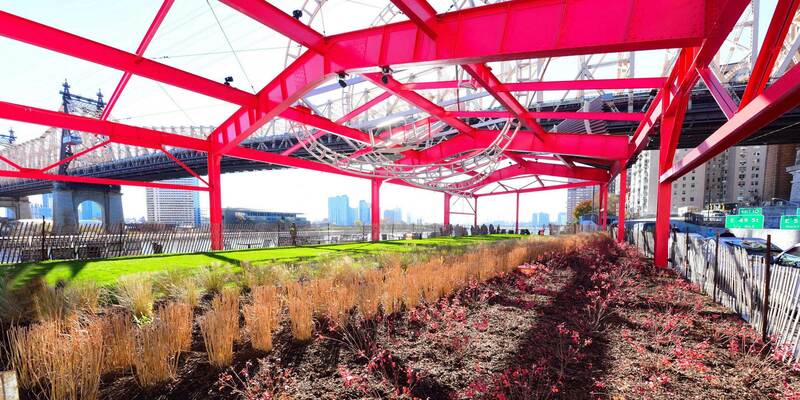 This spring, MAS looks forward to joining Friends of the East River Esplanade led by Jennifer Ratner for a formal celebration at the Pavilion site. Alice Aycock herself will be there, along with music, ice cream and Aycock -related art projects for children. Look for more details on our website in early 2018.